Michelle was the fifth photographer I tried on my search for the perfect family photographer, and she is The One! Her understanding of light and composition in photography is phenomenal, and she was very personable and easy to work with. I also really appreciated that she treated scheduling so professionally, as one of the problems I’ve run into is having photographers schedule our session and then need to reschedule once it gets close to time, which is very frustrating when you have young children! I am thankful to have found such a great photographer for our family. I am so thankful that I found Michelle Barnett Photography. Michelle is amazing at what she does and has captured some amazing memories for my family. If you're looking for a photographer that will give you exactly what you're looking for, then Michelle is it! We were blown away by the work Michelle did for our non profit's social media and fundraising campaigns. One of her photos is still ranked #1 as our most "liked" picture on our social media platforms! Her creativity captured the heart behind Blue Monarch's ministry and she made the shoot fun for everyone. We have used her pictures for fundraising mailers, highlighted them on our website, and feature them often on social media. We can't wait for another shoot! Michelle is an outstanding photographer! She took our engagement pictures and our wedding pictures. We met to discuss a schedule of pictures for her to take. She is very organized and pays attention to details. Michelle also communicated on a regular basis with me. On our wedding day, she arrived early to scout out the location and get some ideas. Her husband, Caleb, is also professional and pays attention to details. I never worried where Michelle and Caleb were during the ceremony. I love when she would post sneak peaks and our wedding album did not disappoint! I am so thankful for the friendship and professionalism that Michelle shows! She truly loves her profession and is so talented! I loved all of our engagement pictures and wedding pictures. She captured memories that will be treasured for a lifetime! I first met Michelle while assisting a bride with her wedding planning. Not only is Michelle an incredible photographer, but she was extremely wonderful to work with. She is talented, organized, and has an incredible gift of being able to snap the perfect shot at the perfect moment. 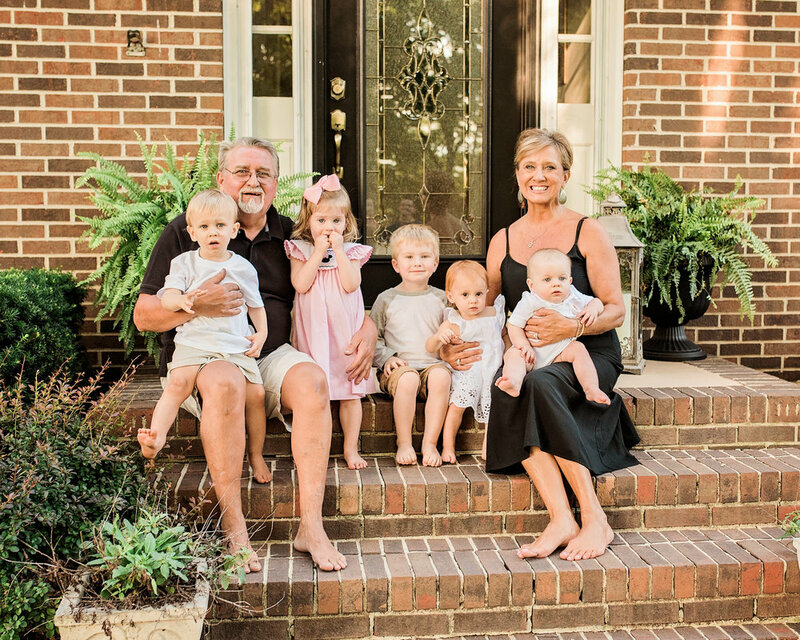 In addition to having the privilege of working with her at weddings, I hired her to photograph my five grandchildren, all under the age of three. She captured each child's personality, and the pictures were absolutely perfect. We were not sure how well the session would go with the young children, but again, Michelle took pictures that were just perfect. I cannot imagine having anyone other than Michelle take my family photos in the future. I have never loved photos I've had done as much as I did when I came to Michelle! Each session I think she can't out do our previous session and then she does. She is always so sweet and patient with my little boy, assuring that our session goes smoothly. So accommodating and genuinely cares for the work she puts out. Highly recommended! There are few reasons why we chose Michelle for the very first time, but many why we continue to choose her to take pictures of and document our growing family. Most importantly, she is patient, understanding, and makes you comfortable. Especially when you are a brand new mom trying to look like you've got it all together during a newborn session as your baby cries, gets hungry, and proceeds to fill up a diaper. Michelle was calm, cool, and collected. For this reason, we have beautiful pictures of our newborn which we can cherish forever. She responds quickly to messages and keeps you informed about the status of your photos. This was only our first experience with her. We were so pleased that a few months later, we booked another, and another... and another when that newborn turns one. We have been more than pleased with each session we've had with her in a matter of 9 months. Although I have one huge problem, there is only one of her!! Michelle went above and beyond to capture our special adoption day! She was flexible, made us feel comfortable, and most importantly captured one of the most precious moments in our family. We revived our photos quickly, and at first glance the memories came to life! Her work will always hold a special place in our home as we share our son's story with him! If Michelle Barnett Photography isn't your go-to photographer, she should be! Michelle is wonderful to work with and always makes sure each pose is flattering. She is calm in every situation and makes even the "least thrilled to be photographed" look fantastic. MBP is perfect for every occasion. My daughter was married on Oct 1, 2016 and Michelle was our photographer. Having her as the photographer was definitely one of the best choices we made. Her pictures were absolutely PERFECT!!!! She went above and beyond to make sure she got all the perfect shots. These are lifelong memories and she made them truly able to cherish. After seeing some of Michelle’s pictures of families and children on Facebook, I gave her a call (I know, who uses the phone anymore?!). Michelle was a pleasure to talk to! Our son Colin was about to turn one and we had not had any professional pictures of our new family of four. After hearing that Michelle had two sons almost the same age as ours, I knew she was a good fit for us. Our boys are active and Michelle was up to the challenge of capturing some great family photos, one year old photos of Colin, and individual photos of each of with the kids. They are truly some of my most treasured pictures! As long as Michelle is taking pictures, we will continue to use her for documenting the stages of our family – whether special occasion or just a yearly documentation of that moment in time. Michelle Barnett Photography went above and beyond to make my big day extra special. She captured every moment possible and all of the pictures came out absolutely breath taking . Michelle went above & beyond to meet my expectations and needs. She also commuted to and from both my engagement session and my wedding session which was over an hour drive! She truly did an amazing job and I can not imagine my big day without her ! I HIGHLY recommend Michelle Barnett ! I will never be able to express in words how fantastic my wedding pictures turned out. THANK YOU!